UP Board 12th Result 2014 available on upresults.nic.in. 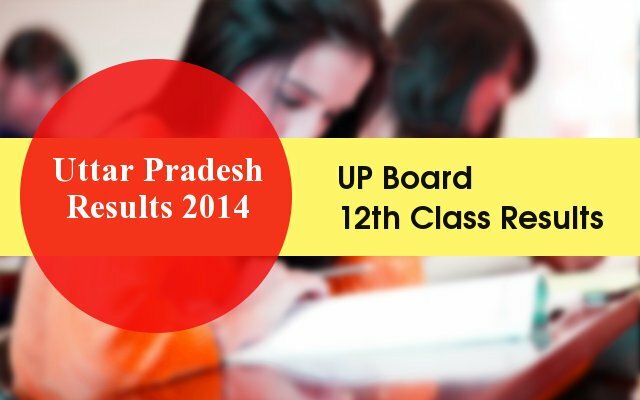 Uttar Pradesh Board 12th Class Results 2014 is now declared by UPMSP. Students from Uttar Pradesh can check their result of UP 12th Class exam on the UP NIC Wesbsite and official website of UPMSP. For UP Board 12th Class Results 2014 visit Uttar Pradesh NIC Wesbite http://upresults.nic.in/ OR India Results website - http://rslt.indiaresults.com/up/upmsp/class-12th-exam-result-2014/query.htm. The roll Numer of UP 12th Class exam is required to check their results. School Head Masters can login in to upmsp website to get school wise results. Students can also check the 12th class results via SMS or Email. Send UP12<space>ROLL NUMBER to 56263 to get results by sms. UP Board 12th exams 2014 were conducted by Board of High School and Intermediate Education Uttar Pradesh in March 2014 and April. In 2014, 31, 27,066 students registered for the intermediate exam with 53,443 students registering from Lucknow itself. The UP Board 12th exams 2014 began on March 3 and ended on April 4 and were held in two shifts from 7:30 am to 10:45 am and evening shift from 2 pm to 5:15 pm. The first Class 12th exam 2014 was for Military Science and Hindi - I and the last exams were for Geography II and Commercial Education V.
School wise results are available for the Head Masters of each schools. Students can get their results by contacting the appeared school itself. Students who have no internet access can get their results from schools itself. In UP Board Class 12 results the pass percentage was 96.32 for girls and 89.79 for boys in 2013. The top three rank holders in 2013 were boys. The total pass percentage in 2013 was 92.68. In the state of Uttar Pradesh (UP), a total of 9121 secondary schools are recognised by the UP Board of High School and Intermediate Education. It has 40 subject committees besides Curriculum Committee, Examination Committee, Result Committee, Recognition Committee, Finance Committee. The Uttar Pradesh Board has the distinction of being the largest examining body in India. A total of 77 subjects are offered by the UP Board for Class 12 intermediate exams. While different subjects are available at different schools from the total 9,121 schools recognized by the UP Board, here is a comprehensive list of all the subjects offered by the Board of High School and Intermediate Education Uttar Pradesh. The exams for all 77 subjects took place across 25 exam dates, beginning from March 3, 2014 and ending on April 4, 2014. The exams were conducted in two shifts, with the first shift of exam being held from 7:30 AM to 10:45 AM and the second short of exam being held from 2:00 PM to 5:15 PM.